Fans are cheering, players are sweating, and the Xfinity Center is bursting with energy as the bright yellow numbers tick down. This is no ordinary Maryland basketball game. It’s not even a university-sanctioned event. It’s the National Hillel Basketball Tournament, an event 1,200 Jewish students will flock to from across the country to compete in and watch this weekend at this university. And the man behind it all is David Stein. 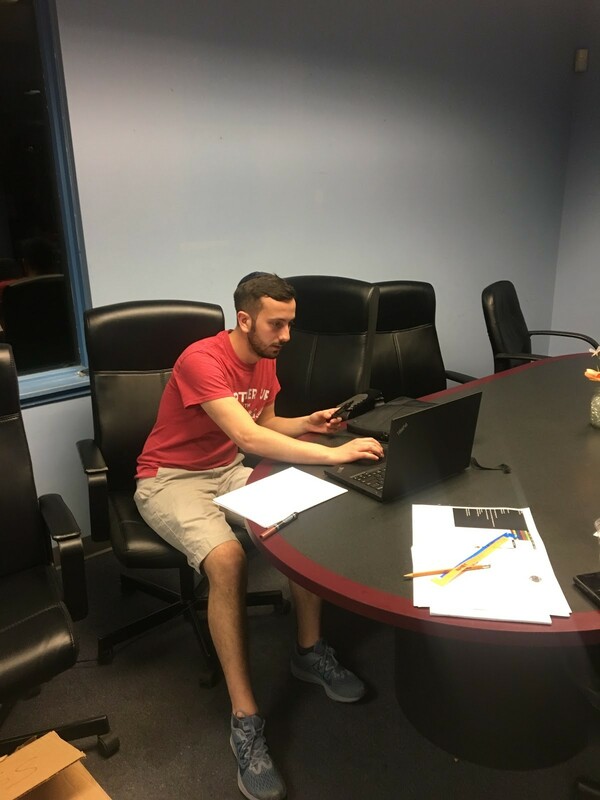 When the senior nutritional science major from Long Island, New York, signed up to join the NHBT board during his freshman year to work on events and attractions, he didn’t realize the magnitude of the job. Stein now chairs the board of 27 students who, in partnership with Hillel, put on a weekend of basketball and bonding for Jewish students each April. Some guests look forward to playing basketball at NHBT, but many capitalize on the social opportunity to see old friends or make new ones. What started out as a small tournament nine years ago has become the social event of the year for the national Jewish collegiate population. Although Stein is a sports fan, he believes the tournament is about more than just basketball. “Basketball is just an avenue to our real goal, which is uniting Jewish students of all backgrounds,” he said. He said his inspiration comes from two stories—one where the tournament created friendships between teammates at the University of Michigan, and another where it inspired a team of previously unaffiliated Johns Hopkins students to eat weekly Shabbat dinners together. “It brings a really good light to the Jewish community because this doesn’t happen anywhere else,” added Engelmayer, who is expecting six additional guests in his 4-person apartment this weekend. But some students don’t like all the disruption that the tournament brings. Stein considers the criticisms “white noise” and tries to please as many students as he can when planning. Juggling individual preferences of even those who enjoy the tournament can present challenges. Some players are unhappy that they will receive hats instead of basketball shorts this year, a change that was made after the board got negative feedback from some on last year’s shorts. “I think that if you’re playing basketball, you should be in uniform,” said sophomore math major Ben Katz, a player for one of Maryland’s teams, who was frustrated about the apparel change. But any pushback Stein receives seems to barely dent all the hard work he puts in. In addition to chairing NHBT, Stein, a pre-med student, represents the agricultural and natural resources college in SGA, is a part of the Gemstone research program and works at Hebrew school on the weekends. “I’ve never seen someone be spread so thin with everything they do while still getting all those things done in full capacity,” said Arianne Mazel, a junior psychology major who works with Stein on NHBT’s executive board. Stein’s passionate drive to work hard may powered him through the biweekly all-nighters he said he pulled during his freshman year. “If it’s something you want to do, you’ll make the time for it. Because you want it,” he said. Stein at Hillel during Tuesday night’s mandatory 7 p.m.-2 a.m. board meeting. Photo courtesy of Shlomit Menashe. This summer, Stein will marry his girlfriend of three years, Gwynne Gershenson, who graduated from this university as a psychology and studio art major last December. Gershenson said that she supports Stein’s commitments to NHBT and understands that the tournament is an important part of his life. Stein’s roommate, senior finance and information systems major Asher Guigui, said he lives in the “NHBT headquarters” and sometimes even has to plan his showers around the preparations. “I have to schedule my life based on when he has meetings,” he joked. As seriously as Stein approaches NHBT and his other commitments, his friends say he knows how to have fun too. Mazel said that she and other board members have a group chat called “Davidisms” where they record the funny phrases Stein says. “He’s just a weirdo,” she said. Board members say Stein’s fun and optimistic side often generate the momentum needed to get the job done. “He pumps everyone else up around him. If you are feeling overworked or you’re feeling like ‘I don’t know if I can do this right,’ he’s like ‘it’s awesome, it’s fine, it’s going to work out, it’s going to be okay,’ ” said Mazel. With Stein’s energy permeating into the tournament, it’s no wonder the weekend generates so much buzz. In campuses across the country, Jewish students are counting down the seconds until it starts. Correction: Certain quotes describing Stein’s personal life were taken out of context in the original article and have since been modified or removed. No Replies to "Jew You Should Know: David Stein"